Was Daniel 12 Fulfilled in the Resurrection of the saints in Matthew 27? I have been asked on numerous occasions to comment on the (supposed) correlation between Daniel 12 and Matthew 27. I have been asked recently to specifically address the question of whether Daniel’s prediction of the resurrection (12:2) was fulfilled in the awesome events recorded in Matthew 27. There are some who believe that the resurrection of the saints in Matthew was in fact the direct fulfillment of Daniel 12. I do not, and will offer a few reasons in a brief series of articles, as to why I reject that suggestion. Those who claim that Daniel foretold the events of Matthew 27 must explain why there is nothing else in the entire chapter of Daniel 12 that comports to this view. If verse 2 is a prediction of the resurrection of the saints in Matthew 27, why is there no mention of Jesus’ death and resurrection? Are we to believe that in the midst of predictions of the other elements, that inspiration essentially dropped a prediction of an unrelated event into the discussion? Let me clarify. The chronological flow of the predicted constituent elements of Daniel 12 forbids application of v. 2 to Matthew 27. Notice that Daniel 12 posits the statement “at that time” there was to be the Great Tribulation. Then, in verse 2 is the prediction of the resurrection. Thus, sequentially, one has the right to say that the resurrection would follow or climax the Tribulation. If this is so, then clearly, verse 2 did not predict the resurrection of the saints in Matthew 27:52. (We would briefly note that in Jewish thought the resurrection was in fact to follow the Tribulation, and this is the Biblical pattern throughout). It is absolutely amazing that there are now some who apply verse 1 of Daniel 12 to the time of Antiochus Epiphanes, but then, they insert a temporal gap of so far 2500 years into the period at the end of verse 1, and apply verse 2 to some imaginary “end of human history” resurrection of human corpses out of the dirt. Without an over-aching theological presupposition at work, one would never get that from the text. This is eisegesis in the extreme. In Matthew 24 Jesus gave the following sequence of events: The appearance of the Abomination of Desolation which of course was foretold by Daniel 12:9f. As a direct result of the appearance of the Abomination, the Tribulation would follow. Note then that in Matthew 24:31 we find the prediction of the resurrection at the sounding of the Great Trumpet. This is a direct reference back to Isaiah 27:13, which in turn is based on the prediction of the resurrection of those “in the dust” (26:19-21), at the coming of the Lord. Is the resurrection “out of the dust” in Isaiah 26 a different resurrection from the resurrection “out of the dust” in Daniel 12? I have never seen a commentator such a thing. Those who would delineate between them bear the burden of proof to demonstrate that they are different. And what is important is that in Isaiah 27 that resurrection is specifically posited at the time when God would spurn the people He had created, destroy the temple, and make the fortified city a desolation (27:9-11). This clearly is not a prediction of the time of the passion and Jesus’ resurrection in Matthew 27. Likewise, to get ahead of ourselves just a bit, Daniel posits the fulfillment of his resurrection promise at the time “when the power of the holy people has been completely shattered.” Thus, just as Isaiah 26-27 gives a sequence of events, Daniel follows that exact pattern. So, we have this sequence of events: Abomination—> Tribulation —> Resurrection. (I should note here that the connection between the Tribulation and the resurrection appears in numerous OT prophecies, not just in Daniel. In text after text, as I show in my book, The Resurrection of Daniel 12:2: Future or Fulfilled? this temporal connection is firm. In addition, in the Jewish eschatological timeline, that connection is set forth as well accepted and firm. This alone falsifies the application of Daniel 12 to the resurrection of the saints in Matthew 27. Those who apply Daniel 12 to Matthew 27 are taking Daniel completely out of the flow of events, and saying that the resurrection of Daniel 12:2 happened, and then, later, the Abomination and Tribulation occurred. There is not a word in Daniel (Or Isaiah 26-27) to justify this. The resurrection of Daniel 12 was to be at the time of the Tribulation, and there is simply no way to say that the events of Matthew 27 were the Great Tribulation, or the climax of it. The resurrection “out of the dust” of Isaiah 26-27 is the same resurrection as in Daniel 12:2. The resurrection “out of the dust” of Isaiah 26-27 would take place at the sounding of the Great Trumpet– at the time of the destruction of OT Israel (27:10-13). Jesus said the sounding of the Great Trumpet (the time of the resurrection) would be at his coming in judgment, power and great glory (Matthew 24:29-31). Therefore, the resurrection “out of the dust” of Daniel 12– being the same resurrection as in Isaiah 26-27– was to be at Christ’s coming in judgment, power and great glory (Matthew 24:29-31). This falsifies any application of Daniel 12 to Matthew 27:52. The resurrection of the saints in Matthew was patently not at the time of Christ’s coming in judgment of Old Covenant Israel. But, let me build on this. The coming of the Lord at the time of the resurrection in Isaiah 26-27 would be when the Lord would come in judgment and vindication of the blood of the martyrs (Isaiah 26:21). The resurrection of Isaiah 26 is the same resurrection as in Daniel 12. But, the coming of the Lord in judgment and vindication of the blood of the martyrs was to be in the judgment of Old Covenant Jerusalem– Not at the cross. Therefore, the resurrection of Daniel 12 was to be at the coming of the Lord in judgment and vindication of the blood of the martyrs in the judgment of Old Covenant Jerusalem– not at the time of Matthew 27:52. (It is important to note that Isaiah was not predicting an individualized “coming” of the Lord at their conversion or death. This is the prediction of an objective historical event related to the corporate judgment of Israel. This is what Jesus foretold in Matthew 23. This is objective or corporate eschatology, not individualistic eschatology). Again, the events of Matthew 27, no matter how intriguing they might be, are not what was predicted in Daniel 12. The order of events in Daniel 12 prohibits application to Matthew 27. The resurrection is inextricably tied to the Great Tribulation– and that was irrefutably not at the time of Matthew 27. Unless one can delineate between the resurrection foretold in Isaiah 26-27 then since Isaiah clearly posits the resurrection at the time of the judgment of Israel, then Daniel 12 must be applied to that time as well. And of course, this is precisely what Daniel 12:7 teaches. Just like Isaiah, Daniel was told that the resurrection would be fulfilled “when the power of the holy people is completely shattered” (12:7). This agrees perfectly with Isaiah, and forbids application of Daniel to Matthew 27. Isaiah posited the resurrection at the coming of the Lord in judgment of Israel for shedding innocent blood. Again, this agrees perfectly with Daniel and Matthew 23, and forbids application of Daniel to Matthew 27. We will offer more on this in following articles. I think it can be easily seen however, that there is no contextual support for applying Daniel 12:2 to the resurrection of the saints in Matthew 27:52. For more, see my book Seventy Weeks Are Determined…For the Resurrection. 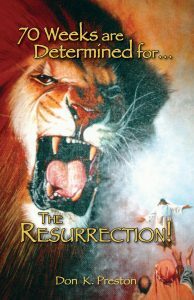 This book contains powerful proof that Daniel 9 foretold the resurrection of the dead! Stay tuned for more as we investigate whether the resurrection prophecy of Daniel 12 was fulfilled in Matthew 27.